Father, you endowed Saint Vincent de Paul with the spirit of an apostle to give himself to the service of the poor and to the training of priests. Give us a share of the same spirit that we may love what he loved and do as he taught us. Through our Lord Jesus Christ, your Son, who lives and reigns with you in the unity of the Holy Spirit, one God, for ever and ever. Amen. 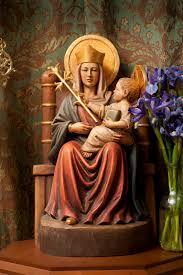 Our Lady of Walsingham, pray to the Lord for us. Mary conceived without sin, pray to the Lord for us. Mary the Virgin, pray to the Lord for us. Mary, the Mother of God, pray to the Lord for us. Mary taken up into heaven, pray to the Lord for us. Mary who stood by the Cross, pray for all who suffer. 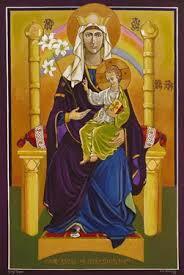 Mary model of womanhood, pray for all women. Woman who followed Him, remember us to God. 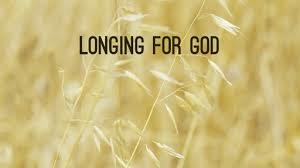 Woman who loves Him, remember us to God. Mother of Men, be our Mother always. All holy and ever-living God, in giving us Jesus Christ to be our Saviour and Brother, you gave us Mary, his Mother, to be our Mother also; grant us, we pray you, that we may be worthy of so great a Brother and so dear a Mother. May we come at last to you the Father of us all through Jesus Christ Your Son, who lives and reigns with you and the Holy Spirit for ever and ever. Amen. Reflection: “I confer a kingdom on you, just as my Father conferred one on me: you will eat and drink at my table in my kingdom, and you will sit on thrones to judge the twelve tribes of Israel” (Lk 22:30). Thy kingdom come, thy will be done on earth, as it is in heaven. Let us pray for the conversion of our country, that through the reconciling prayers of Our Lady of Walsingham it may once again be worthy of the title “The Dowry of Mary”. The Prayer of the Feast: Lord God, in the mystery of the Incarnation, Mary conceived your Son in her heart before she conceived him in her womb. As we, your pilgrim people, rejoice in her patronage, grant that we also may welcome him into our hearts, and so, like her, be made a holy house fit for his eternal dwelling. We ask this through Our Lord Jesus Christ, your Son, who lives and reigns with you in the unity of the Holy Spirit, one God for ever and ever. Amen. Intention of the day: For vocations to the priesthood, diaconate and the consecrated life. Reflection: “A great sign appeared in Heaven: a woman adorned with the sun, standing on the moon, and with twelve stars on her head as a crown” (Rev 12:1). The stars represent the twelve tribes of Israel, God’s chosen people, and the holy apostles. 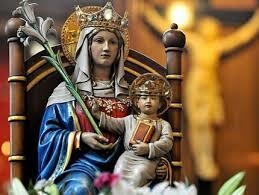 Our Lady is the Queen of priests and their Mother. 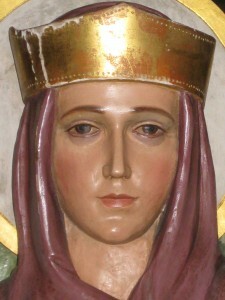 We pray that the Pope, the bishops, priests, deacons, religious, and consecrated men and women of the Church may set themselves close to Our Lady as her crown, and that women, men and children everywhere may offer themselves totally to God. Prayer: Father, you raised the Mother of your Son to the glory of Heaven, grant through her intercession that the hearts and minds of all may be open to your call, so that loving you above all things we may be signs of your presence, and ardent but gentle servants of the Gospel. Amen. Intention: We pray for the intentions of all our Dioceses in England and Wales and for our Bishops. We pray for vocations to the Priesthood and for a flourishing of seminary life. We pray for all seminarians and for those in the process of discernment. We pray in thanksgiving for our Religious Orders both active and enclosed, all forms of consecrated life and for Deacons.